Before coming to RSE, I had the feeling it was more aimed at tuners – people looking to modify their WRXs or get some help on builds. 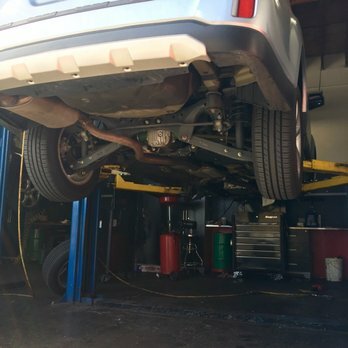 But I was totally wrong – if it’s a Subaru, they will service it and they will service it well. Raul helped me out with a brake service, quoted me on a full service but it ended up only being a front brake service. While setting up an appointment and waiting for my car while it was getting new brake pads, I really got to see that Raul and his crew a) really know what they’re doing, b) really love what they’re doing, and c) really deserve all these great reviews. Scheduling an appointment wasn’t terrible – and while it may be tough because they’re only open M-F, Raul does do pickups/drop offs in the area and also offered a loaner car. RSE’s got my business for the rest of my time in Orange County. Up she goes – my 2013 Outback. Not pictured: the dozen WRXs, Legacy, Outbacks, and Forester in the lot.